Is AlphaGo the Master? A mysterious online player has been making huge waves by defeating dozens of top professionals on go sites in Asia in recent days. “Master” first appeared on December 30, 2016 (Beijing time), registering from Korea. Achieving 30 consecutive wins against many former and current world go champions, Master defeated Park Junghwan four times and Ke Jie twice. After that, Master appeared on a different go site and logged another 20 consecutive wins. That made it 50 games in a row with no losses. While the essentially universal consensus is that this is another AI player, it’s hotly debated whether this is a new edition of AlphaGo or not. More and more seem to believe it is. There’s been no official statement from the AlphaGo team thus far, and Aja Huang cryptically responded “interesting” to speculation that AlphaGo is Master. 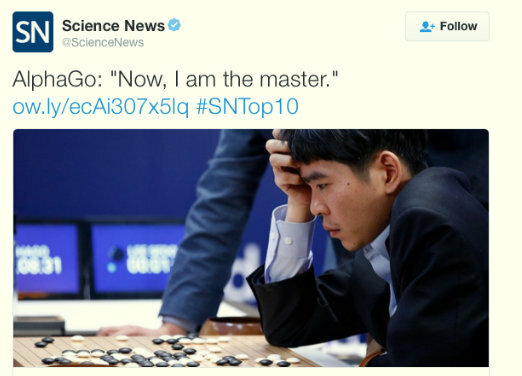 Adding fuel to the rumors, ScienceNews tweeted “AlphaGo: Now I am the master” promoting it’s Year in review: AlphaGo scores a win for artificial intelligence story on December 29, just before Master first appeared. On January 4 (local time), the sina.com news site was ready when Master resurfaced. It broadcast the games live, accompanied with anonymous commentaries. The Taiwanese player Zhou Junxun 9p tried first with a strategy of playing “Symmetry Go” or “Imitation Go.” But Master’s superb opening (Zhou’s own impression after the game) thwarted that effort, notching win #51. The Chinese player Chen Yaoye 9p was the next challenger. But his computer disconnected and Chen was not able to continue. There were sarcastic comments among viewers that Chen had inadvertently broken Master’s win streak, since a game dropped after only a very few moves was technically ruled a draw. The next two games, against Fan Tingyu 9p and Huang Yunsong 6p, resulted in Master’s 52nd and 53rd consecutive wins and are posted below. Master’s 59th and 60th (and last) games against Zhou Ruiyang 9p and Gu Li 9p also appear below.